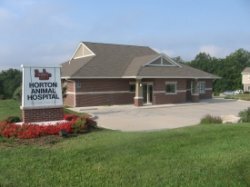 Welcome to Horton Animal Hospital-Forum! 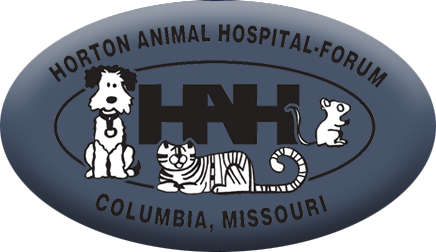 Horton Animal Hospital-Forum has seen many changes over the years. Originally opened as an out-patient clinic, we have grown into a full-service hospital. We enjoy working with our traditional (dog & cat) and non-traditional patients (rabbits, guinea pigs, ferrets, rodents, reptiles, and many others). Our mission is to provide quality care and attention to all our patients and their owners. As animals' needs change from pediatrics to adulthood and on to geriatrics, we strive to assure their quality of life. In addition to preventative medicine, we have in-house hematology and blood chemistry analysis, radiology, ultrasound, dental, surgical and hospitalization facilities on site. Boarding and grooming services are also available. The opening of our new hospital in June of 2005 allowed us to care for more patients with expanded housing areas and provide dedicated parking for our clients. We are located between Forum Blvd. and Chapel Plaza Court just south of Chapel Hill Road. At Horton Animal Hospital-Forum, we treat your pets like the valued family members they are. Please browse our website to learn more about our animal clinic and the services we provide for companion animals in Columbia and the surrounding areas. Read information in our Pet Library, view videos, take a virtual tour of our veterinary hospital, read testimonials, and find details about upcoming events. Please call our office today at (573)446-3227 for all your pet health care needs.